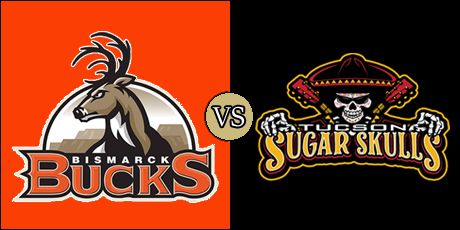 What: It's the franchise home opener for the Sugar Skulls as they host the Bucks. When: Sunday, March 10 at 3 p.m. pacific (5 p.m. central). Where: Tucson Convention Center; Tucson, Arizona. 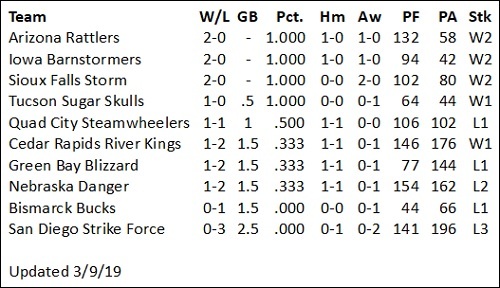 2019 Head to Head: May 18 - Sugar Skulls at Bucks. Note: This is the first-ever meeting between these teams, as they are both new to the IFL this season. The Bucks are 0-1 overall and 0-1 on the road. They are coming off a 66-44 road loss to the Nebraska Danger on February 23. The Sugar Skulls are 1-0 overall and 0-0 at home. They are coming off a 65-44 road win over the San Diego Strike Force on March 3. Bucks QB John Gibbs (#5) and RB Jeff Mack II (#4). Sugar Skulls WR Shaq Curenton. 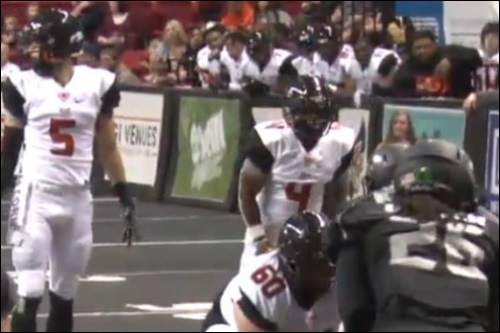 Two of the Indoor Football League's newest teams clash in their first-ever meeting. The Bucks are coming off a bye week after falling to the Nebraska Danger in week 1 by a 66-44 count. There were some bright spots, as they scored 25 second-half points. The first half turned out to be Bismarck's Achilles heel. They will look for their first IFL win as they find themselves on the road for a second straight game. The Bucks made the move from Champions Indoor Football over the off season. The Sugar Skulls are riding high after winning their franchise opener, 65-44, against the San Diego Strike Force. After having a bye in week 1, they came to play in their visit to San Diego. This is the home opener Tucson and they are hoping to improve to 2-0 in front of their home fans. Despite the Bucks' loss in week 1, they could prove to be a formidable opponent. Veteran John Gibbs is expected to be under center in this game. Though he completed just 48.4 percent of his passes in the opener, he went for 216 yards with two touchdowns and an interception in the opener. Gibbs also rushed eight times for 48 yards and four scores. All other rushers totaled 10 combined yards of 14 carries, so finding a consistent running back to compliment Gibbs should be a key in this game. Jeff Mack II or Diante Thomas likely will be called upon to provide that punch. Mack caught 3 passes for 53 yards. Mike Tatum, who signed as a free agent over the winter after a successful tenure with the Sioux Falls Storm, was as good as advertised. He hauled in eight passes for 126 yards and two scores, and rushed for a touchdown. Defensive back Antwan Smith paced the defense with seven total tackles and a blocked kick. He should get some help in the backfield from fellow DB's Michael Jenkins and Ryan Poomailhealani, who each broke up a pass in week 1. Defensive lineman Stephon Hall had a fumble recovery. Blake Levin comes in having converted two of three extra point attempts. He has not attempted a field goal. A familiar IFL face signed last week and saw the majority of the action under center for the Sugar Skulls in their opener. Former Cedar Rapids Titan Jake Medlock led the league in every major passing category last season as a rookie. He completed 71.4 percent of his passes for 142 yards with four touchdowns and no interceptions. Former Green Bay Blizzard signal caller Matt Behrendt started the game, completing four of his six passes for 67 yards and a touchdown, while rushing for another score. Mike Jones was effective in the opener with 43 yards off 11 rushes and two touchdowns. He also caught a touchdown pass. Shaquan Curentoncaught four balls for 82 yards and three scores. Donovan Rasberry and Brandon Sampson had 53 and 58 yards receiving, respectively, and the former caught a touchdown pass. Linebacker Zachary Allen had nine total tackles, while defensive back Dee Maggitt, Jr. recorded seven, as well as two interceptions. Keith Jones, Jr. tallied a sack and a fumble recovery. Diego Marquez went nine of nine on his extra point attempts, but was unable to convert on his two field goal tries. 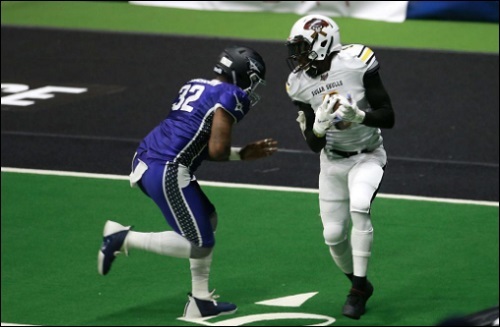 March 9 - San Diego Strike Force at Cedar Rapids River Kings, 5:05 p.m.
March 9 - Green Bay Blizzard (1-1) at Iowa Barnstormers, 5:05 p.m.
March 9 - Sioux Falls Storm (1-0) at Nebraska Danger (1-1), 5:05 p.m.
March 10 - Bismarck Bucks (0-1) at Tucson Sugar Skulls, 3 p.m.
We're about eight or so minutes from kickoff. Should be an interesting game. It'll be interesting to see what kind of crowd they get in Tucson for the opener. Locally in Tucson, this is on the CW affiliate. That's a pretty solid move for the team. The Bucks won the coin toss and have elected to defer. The Sugar Skulls will receive the opening kickoff. Rouge Bucks. Kickoff not returned outside the end zone. If the boxscore is any indication, we may actually get some live scoring. Is that the old L.A. Kiss field. Touchdown Sugar Skulls. Brandon Sampson 6 yard pass from Matt Behrendt. Diego Marquez kick. The Bucks scored a "roog." They have no clue why a team would defer in indoor football. Don't get me started on the Rattlers releasing Shad Thornton at the end of training camp and the Sugar Skulls "conveniently" signing him. Not looking great for the Bucks after being stopped on downs. It definitely looks like it. Looks like Homer Causey started at QB for the Bucks. Touchdown Sugar Skulls. Donovan Rasberry 12 yard pass from Matt Behrendt. Diego Marquez kick. These guys are pretty green when it comes to this sport.